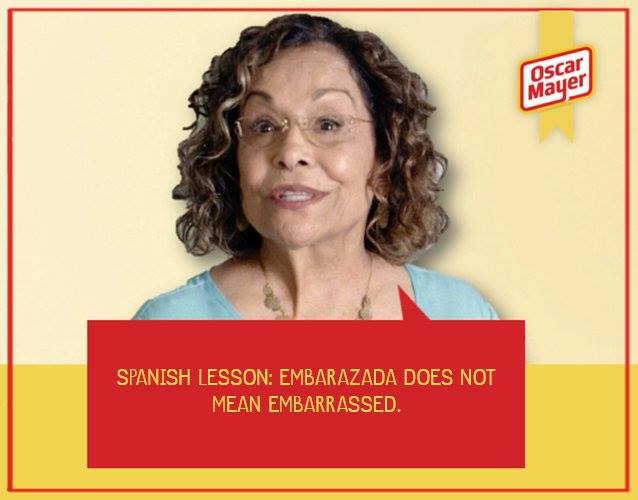 From Oscar Mayer, the company that brought us the disgusting sausage flasher, now comes Lola: The Abuela Who Tells it Like it is, a Facebook fan page featuring a bilingual, annoying abuela that has managed to amass almost 18,000 likes. When she is not peddling recipes based on Oscar Mayer products, Lola spends her time sharing advice on family gatherings, laundry, married life and other mundane things while speaking her mind and saying things as they are “wether we like them or not.” She even takes the time to give us Spanish lessons -in English- and at least as far as I could see, she has better grammar than the Procter & Gamble abuela. Creative # 1: Oh, I get it! Let’s make her fun and irreverent. That’ll do it. This entry was posted in Food, Marketing & Advertising, Spanish, Stupid propositions and tagged abuelas, Hispanic marketing, Oscar Mayer. Bookmark the permalink.